Dr. Wallace keeps abreast of the latest contact lens technologies and products. Do you need contact lenses near you? August Wallace Eyecare Associates in Longview offers soft contact lenses (disposable, toric for astigmatism, multifocal for bifocal wearers, monovision fits, and color contacts). We fit gas permeable rigid lenses for both single vision and bifocal Rxs. In keeping with the latest developments in contact lenses, August Wallace Eyecare Associates in Longview offers all the three fitting sets for Synergeyes hybrid contacts which has a rigid center and a soft lens skirt. In order to maintain optimum eye health, the staff trains each new contact patient on the use and care for their particular type of contact. Note, each type of contact has specific requirements. Our office is just minutes away from Hallsville and Gilmer. If you're coming from that direction, contact us for directions! The purpose of this design is to provide the visual clarity of GP lenses, combined with wearing comfort that is comparable to soft lenses. 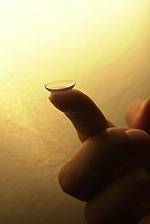 Contact Lens Overuse - Don’t abuse your contacts & avoid the eye health risk!